This code logically suggests an intelligent creator. —a source of greater intelligence to have put the information there in the first place. Recognizing the implications of this code, many famous scientists, like Sir Francis Crick, one of the co-discoverers of DNA’s molecular structure, sadly suggested that the immensely complex information was put there by aliens billions of years ago.4 This suggestion, in effect, is no answer at all because it does not solve the problem of ‘first life’. After all, who created those alleged aliens, and so on? 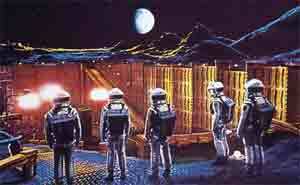 In this scene from the science-fiction movie 2001: A Space Odyssey, a group of astronauts look onto an excavation site on the moon where an alien artefact has been located. The movie’s plot describes the object as having been planted in the far distant past by mankind’s alien ‘creators’ to be found only when humans had ‘evolved’ to a sufficiently advanced level, beyond 'religious prejudices', to find and understand our true heritage. Many evolutionists have claimed that so-called ‘junk DNA’ is a leftover from our evolutionary past.5 This is similar to the spurious claim about ‘vestigial organs’, such as our appendix.6 Along with over 100 other organs, the appendix was mistakenly thought to have no practical use in the human body. The term ‘junk DNA’ came about because, unlike ‘normal’ DNA, it does not code for proteins. Quite simply, scientists had not identified any of its uses. But just because no function was known, doesn’t mean there is no function. Recent discoveries have shown many uses, and more are being discovered all the time. One example is the ability of so-called ‘junk DNA’ to jump to chromosomes with broken strands of DNA, slip into the break and repair the damage—an essential function in keeping the whole cell viable. Davies’ idea would provide a powerful, but fanciful, way to explain the prevalence of ‘junk DNA’, which has been a stumbling block to the idea of human evolution. Because this non-coding DNA appears to occupy up to 98% of the genome, the process of natural selection would favour creatures that did not have to waste resources processing a genome filled with 98% junk. Quite simply, according to ‘survival of the fittest’ schemes, the ‘junk’ shouldn’t be there. However, in a veiled acknowledgment that they don’t understand everything, Davies’ suggestion perhaps helps evolutionary biologists to ‘hedge their bets’. Evolutionists are increasingly being confronted with the enormous complexity of DNA and, thus, the mystery of the origin of life itself. Davies’ fictional use for ‘junk DNA’ actually highlights the current ignorance about these details; yet ironically, he and his colleagues are still sure that evolution is true. Also, Davies’ idea only creates other questions. Why would aliens put hidden messages in our DNA anyway? Once again, we see how presuppositions play a part in interpreting the evidence, even to the extent of crediting unseen and unproven aliens with the incredible ‘power of creation’ that is due God. 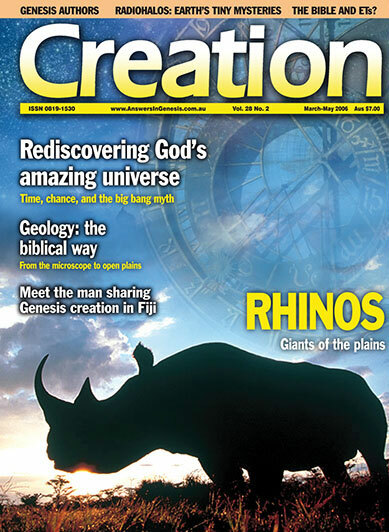 Rather, the Bible tells us that creation reveals God as the awesome Creator (Romans 1:20). Wow! Communications from little green men?